New office opens for Free Legal Clinic | Berkshire Center for Justice, Inc. 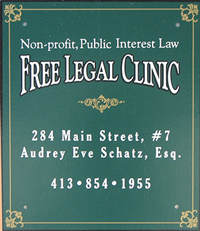 The Free Legal Clinic is proud to announce our first public office at 284 Main Street #7 in Great Barrington, Massachusetts. We are fortunate to have Terrence Cooney a retired attorney to staff hours Tuesday and Thursday mornings from 9am-12pm. Call 413-854-1955 to schedule an intake with Mr. Cooney or Founder, Eve Schatz. This location brings us more visibility on Main Street so that those in need of our essential services can find us. We are grateful for and want to thank artist Mark Buchman for making and installing our fabulous sign. This entry was posted in Uncategorized and tagged H & R Block. Bookmark the permalink.